Greece The Minoans - HISTORY'S HISTORIESYou are history. We are the future. A long time ago, there lived a king named Minos. King Minos lived on a beautiful island called Crete. King Minos had a powerful navy, a beautiful daughter, and a really big palace. Still, now and then, King Minos grew bored. Whenever King Minos was bored, he took his navy and attacked Athens, a town on the other side of the sea. The people of Athens grew tired of King Minos. The king of Athens, King Aegeus, offered King Minos a deal. If Minos would leave Athens alone, Athens would send seven Athenian boys and seven Athenian girls to Crete every nine years to be eaten by the Minotaur. The Minotaur was a horrible monster that lived in the center of a huge maze in the King's palace on the beautiful island of Crete. Rather than feed the Minotaur the children of Crete, King Minos much preferred to feed the Minotaur Athenian children. King Minos took the deal. According to myth, the Minotaur was the result of a union between King Minos' wife and a snow-white bull given to Minos by Poseidon. Everyone in Athens was crying when they were called upon once again to send their children to be eaten by the Minotaur. Prince Theseus of Athens was very young, but he knew that it was wrong to send small children to be eaten by a monster just to avoid a battle with King Minos. Prince Theseus told his father, King Aegeus, that he was going to Crete with the children and he intended to kill the Minotaur. His father begged him not to go. He was afraid his son would be eaten. The prince, however, was determined. Theseus told his father that if he were successful, he would return to Athens flying a white sail. The white sail would signal to all of Athens that Theseus had been successful and had survived. After a hurried goodbye, Prince Theseus sailed toward Crete. When the prince and the children arrived, King Minos and his daughter, the Princess Ariadne, came out to greet them at the harbor. The king told the Athenian children that they would not be eaten until the next day, and implored them to feel free to enjoy themselves in the palace until that time. The Princess Ariadne did not say anything. One look at Prince Theseus, and she had fallen in love. She wanted to save Prince Theseus. Later that same day, Ariadne gave Theseus a sword and a ball of string. She told him to tie the string to the door of the maze, and unroll it as he moved through the labyrinth. That way, he could find his way out again. Theseus knew she gave him the sword to kill the Minotaur. Solemnly, Theseus thanked the princess. The next morning, the Athenian children, including Prince Theseus, entered the maze. The door clicked shut and locked behind them. Following Ariadne’s directions, he tied the string to the door. He told the children to stay by the door. He entered the maze and walked until, finally, he found his way to the very center. There, he was met by the Minotaur and a huge battle followed. Using the sword Ariadne had given him, Theseus killed the Minotaur! He followed the string back and knocked on the door. Princess Ariadne was waiting. She opened the door. Prince Theseus and all the children ran to their ship and sailed away. Princess Ariadne sailed with them. On the way home, they stopped for supplies on the island of Naxos. There, Ariadne fell asleep. Theseus left her sleeping on the island and, with the children, sailed away. In Theseus' haste to return home, he had forgotten to raise a white sail. Standing look-out on a cliff above the sea, King Aegeus watched for the return of Theseus. When he spotted his son's ship from a great distance and noticed that the white sail was not raised, he was overcome with grief. Watching the blackened sail near, King Aegeus threw himself from the cliff where he stood and into the sea where he drowned. Ever since, the sea has been named the Aegeian Sea. It was a sad time, of course. Because the children of Athens were saved, however, it was also a happy time. All the people of Athens were proud of their young prince who ruled as his father had, as the king of all the people of Athens. King Theseus ruled for a very long time. He was a very good king. Brain Box: Is the story of Theseus a Minoan story? The Minoans: Unlike other early civilizations, Greece lacked the type of great rivers that allowed the peoples of Mesopotamia, India, Egypt, and China, to settle down and thrive. What Greece did have, however, was miles and miles of coastline. That geographic difference led the Greeks to develop along lines quite distinct in the ancient world. What key advantages did the Minoans gain from settling on Crete? The earliest Greek civilization, the Minoan, sprung up on the isle of Crete over 8000 years ago. Most likely, the earliest settlers came by boat from Asia Minor, present day Turkey. For thousands of years they lived peacefully in caves and in simple huts, isolated from the rest of the world. Unlike mainland Greece and the Peloponnesus Peninsula, however, Crete's land supported agriculture. Further, these early Greeks could not have asked for a better, more strategically placed position in the Mediterranean. They were square in the middle of Mediterranean trading routes that led in all directions of the compass. Because of those geographic features, these early settlers gradually developed more sophisticated skills and eventually grew to be a major power in the region. The calm waters of the Mediterranean Sea that surround Crete provided excellent fishing grounds for the Minoans. With the sea at their doorstep, the Minoans built large naval and merchant fleets of ships powered by sails and oars. In addition to the resources the sea provided, with vast agricultural areas on the island, the Minoans became excellent farmers and grew surplus crops of oil, grains, and honey, which they traded as far away as Syria and Egypt. Their trading abilities and wealth allowed the Minoans to import materials that they did not have locally. 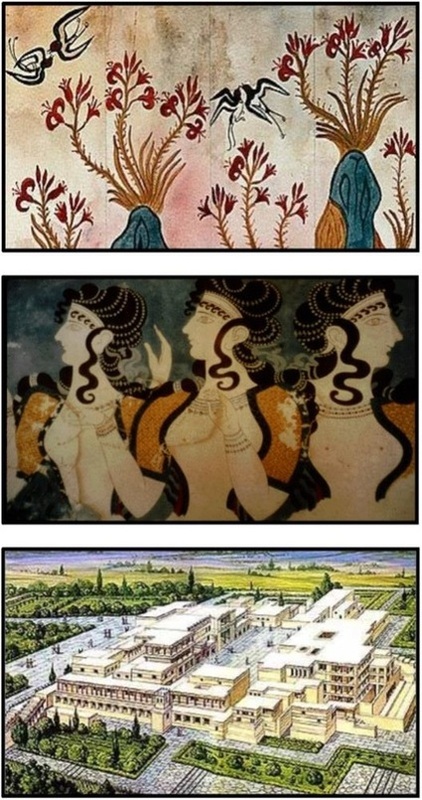 With such abundant resources and the wealth that came from trade, the Minoans surrounded themselves with beauty. They created especially fine art, fresh with charm. The walls of their homes were brightly colored with painted scenes of their daily life and of the life around them, starfish and sea critters and flowers. With imported gold, silver, and other metals they created elegant swords and daggers. They appear to have cared greatly about personal appearance. They made jewelry from gold and ivory and semiprecious stones in various colors. They had beautiful hairstyles and luxury items like combs and brushes that were designed using gold and gems. Their pottery was made in fun shapes and decorated with geometric designs. King Minos and his Palace: The Minoans take their name from the legendary King Minos, and their wealth and power is evident in the grand palace from which he ruled at the capitol city, Knossos. The palace itself covered over six acres. It was a magnificent place! The palace had great courtyards, interior light wells, and halls for huge gatherings, wide staircases that led to different floor levels, and at least 1500 rooms! There were so many passageways that they acted rather like a labyrinth, a maze. Since it was built of gypsum, the palace itself was dazzling white. The interior walls were decorated with murals in rich colors with incredibly detailed scenes of their daily life. The murals are a statement about the wealth and power of the Minoans. CLICK above to view a short video about the palace of King Minos. From whom do the Minoans take their name? Homes: Equally impressive, archaeologists have found that even common Minoan homes were made of stone and had 4, 6, or 8 rooms, plus a bathroom! It appears that many of their homes had running water, water they could use to drink, to bathe with, and to flush waste away. Reading and Writing: The Minoans spoke a language we can’t understand, and wrote a script that we can’t read. Archaeologists have found much to read, like the tablet at left. Should they ever figure out how to read the ancient Minoan script, history books might have to be rewritten! 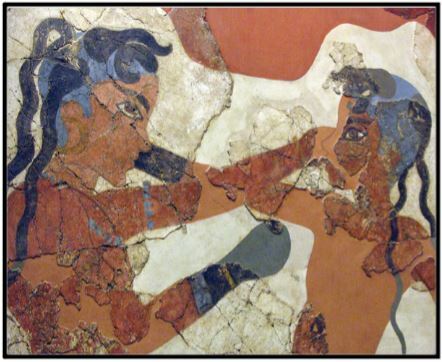 In the meantime, we look to the Minoan art to try and figure out how these ancient people lived. Leisure Activities: From their paintings, it would appear that men and women were pretty equal. One of the sports they seemed to love was bull jumping. There are many scenes of both young men and women happily jumping over bulls. They also had gaming boards, which shows they loved games. And, of course, Crete was an island, surrounded by water. Much of their leisure activities had to do with swimming, diving, and sailing. Religion: They had a religion. They worshiped goddesses, especially the Snake Goddess. Some archaeologists believe that the Minoan's high regard for women stems from the worship of the snake goddess, or Mother Goddess. Snakes were worshiped in every household as guardians of the home. Only those women blessed by the Mother Goddess were allowed to bear children. The Queen may have even been worshiped as a representative of the Mother Goddess. Because of this elevated status, Minoan women appear to have enjoyed many freedoms that were denied women in other ancient cultures. They participated in sports, hunted, and attended cultural events such the theater. Defense Works: Surrounded by all these riches, the Minoans seemed to have had little or no defense works. They were not a warring nation. Rather, they seemed to have happily scooted around the Mediterranean, trading and getting along wherever they went. They scattered wealth about, both among their own people and with their neighbors. What led to the downfall of Minoan civilization? Natural Disasters: Around 1700 BCE, there was a horrible earthquake. Crete was hit hard. The palaces and buildings of the Minoans were destroyed. The Minoans built new palaces on the ruins of the old ones, palaces that were even bigger and better. Ancient Crete hummed with life. Around 1500 BCE, however, the Minoans were hit again, this time by a volcanic eruption, followed by tidal waves over 500 feet tall. 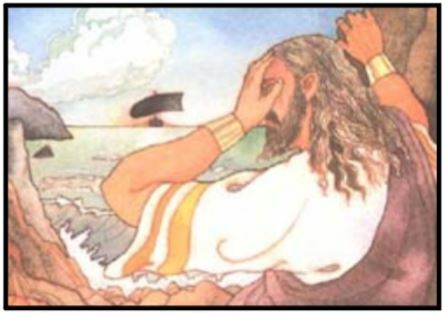 Huge walls of water crashed upon the shores of Crete, devastating the fleets of Minoan ships. Clouds of choking ash suffocated animals and people. Fires ignited by flying ash swept through buildings and poisonous gas enveloped the land. You can trace the rise and fall of Minoan civilization in the evolution of their pottery: Left to right above, early pots were unique, one of a kind creations with geometric designs that reflected themes of nature in abstract forms. Later pots were decorated with stylized nature themes. The last pot is an example of the simple, repetitive style that replaced the earlier, more unique designs.VIEW the slide show below to examine more Minoan art.